This rich, flavorful and brothy version of potato leek soup is a bit of a departure from the more traditional creamy, blended version. And, it’s made extra filling and savory from the addition of delicious smoked sausage! Potato leek soup is one of those soups that traditionally gets blended to a smooth, creamy finish, which is the way that we often find it offered up in recipes or on a restaurant menu. 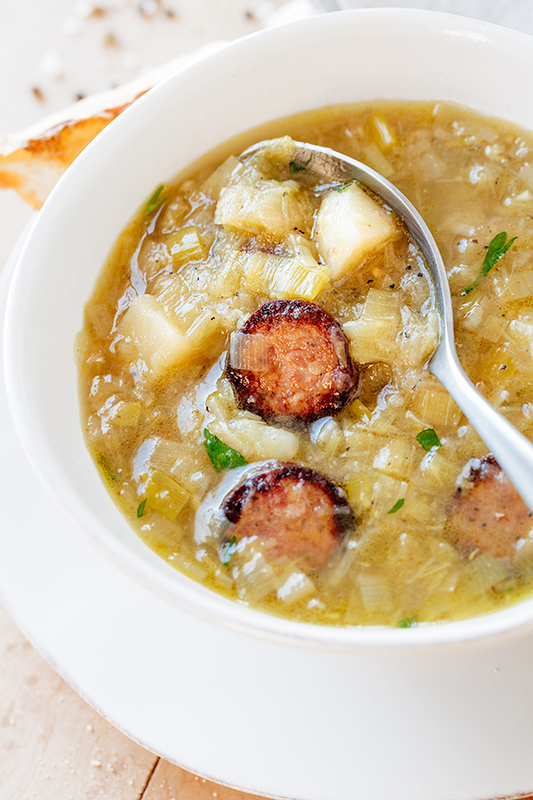 But I’ve found that leaving this soup on the brothy side, and adding in some savory smoked sausage, is an absolutely heavenly way to prepare and enjoy it. It’s so hearty and flavorful that way! So the recipe I’m sharing here is my slightly lighter yet more savory take on the classic leek and potato soup. And because I preserve the rich broth, it allows the potatoes, the leeks, and that juicy smoked sausage to be seen and their unique textures and flavors to be tasted. The ingredient list for this recipe is on the short side, and I love that. This is a quick-cooking soup (right around 20 minutes!). The ingredients are layered into the pot and simmered just until tender, creating lots of big, bold flavors, not to mention that hearty texture that’ll leave bellies happy and feeling satisfied. I find that serving this soup with warm, rustic bread on the side makes it not only a complete meal, but also super cozy—it truly needs nothing else! I begin by caramelizing the smoked sausage slices in the soup pot. Once browned, I add in the leeks, and allow those to get a little color and soften. Next I add in the garlic, allow it to become aromatic, then add in the potatoes and the stock. I allow the soup to simmer until tender, about 20 minutes. I finish off my leek and potato soup with a little squeeze of lemon juice for brightness, some chopped parsley. It’s scrumptious served with warm bread and butter! Your favorite smoked sausage: I like to use smoked kielbasa in this recipe, but another great pick is smoked beef sausage. You can substitute your own personal favorite sausage as well! 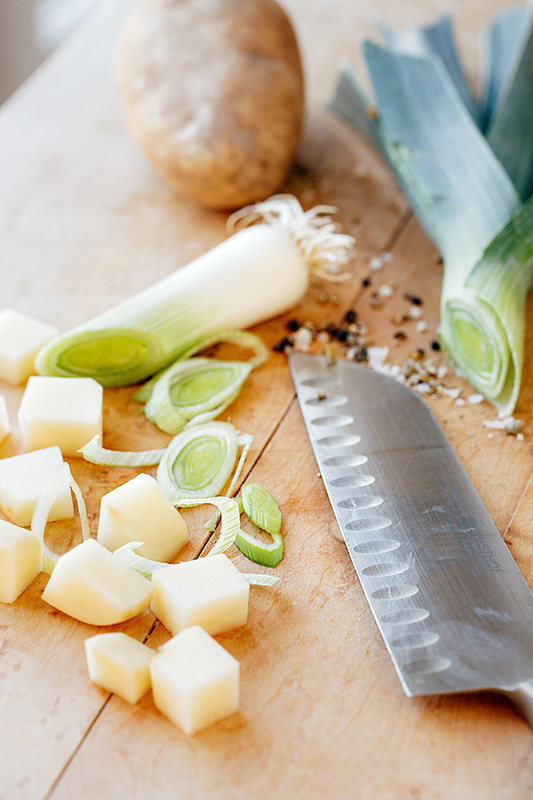 Slicing your leeks: When working with leeks, you want to use only the white and pale green part of them. Cut the long green stems off, and discard those. Then, cut the leeks in half length-wise, give them a rinse, and slice them into thin semi-circles. Make things vegetarian: This recipe can easily be converted to be vegetarian. Simply leave out the sausage and substitute vegetable stock! 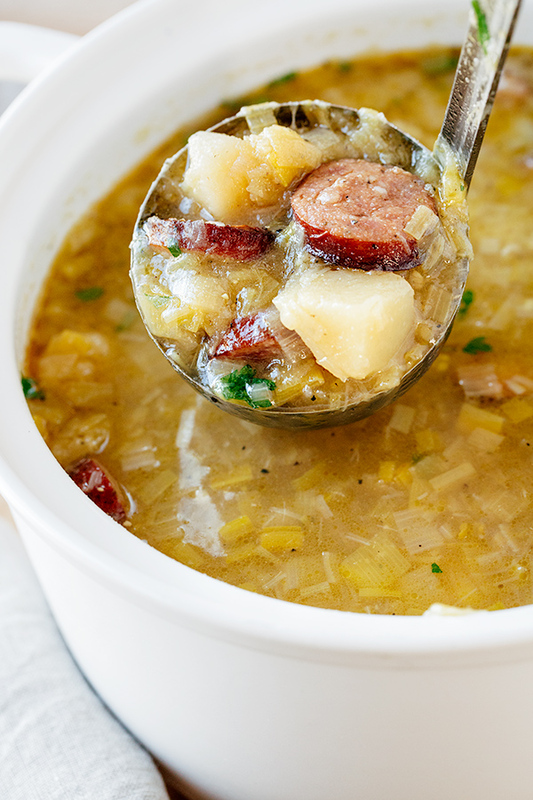 This savory potato leek soup is rich, brothy and light, filled with leeks, garlic, potatoes and hearty slices of delicious smoked sausage! -Place a large soup pot over medium-high to high heat, and drizzle in about 2 tablespoons of oil; once the oil is very hot, add in the sliced smoked sausage, and leave it undisturbed for a couple of minutes to allow for it to caramelize and get some good color; then stir, and allow it to caramelize some more for several minutes. -Once the sausage is browned, drizzle in a little more oil (if the sausage is not too greasy already), and stir in the sliced leeks; it may seem like a lot of leeks, but they will cook way down as you allow them to also caramelize and get golden with the sausage, about 10 minutes, or so. -Once the leeks are golden-brown, add in the garlic, a pinch of salt and black pepper, and stir just until the garlic becomes aromatic; then, add in the potatoes, along with the hot chicken stock, and bring to the boil. -Reduce the heat, cover with lid just partly askew, and allow to simmer for about 20 minutes, or until your potatoes are tender. -Finish with the lemon juice and the parsley, and serve with some good bread. Hungry for more soups? 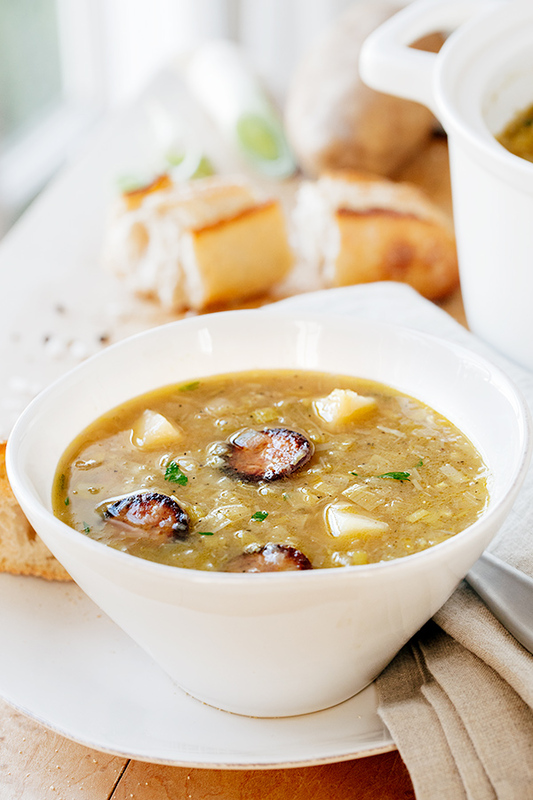 Check out this Chorizo Soup, this Italian Vegetable Soup with Spicy Sausage, and this Beef Barley Soup! 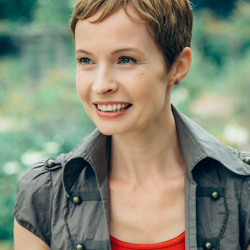 And if creamy soups are your thing, try my Carrot Ginger Soup or my Tomato Basil Soup! I’ve been waiting and anticipating your next email. 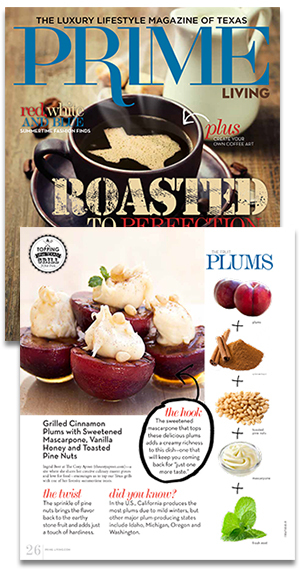 Deborah, thank you so very much for such a kind compliment…may you be warmed and uplifted by the recipe! I made this soup last week, and it was so good! The addition of parsley and lemon juice is so creative and delicious! I accidentally doubled the broth amount and it was still good. Thank you! Ingrid, I can’t wait to try the soup! Ruth, please enjoy the soup! I made this tonight. Added in some minced onion, and mixed vegetable broth and chicken stock, because that’s what I had, and it was amazing! First time I’ve ever cooked with leeks, and honestly, it was so flavorful and hearty. Cannot wait to make this again! Hi Taryn, so glad you tried this! 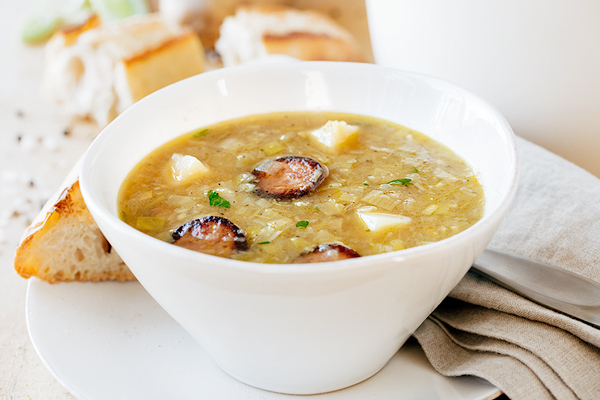 Happy you enjoyed it and that you found a little warmth & comfort in this simple soup. Sarah, thank YOU! So glad you enjoyed! Can I make this and freeze leftovers? Just 2 of us, so I like to freeze the extra for a day that I am working late and just be able to pull out of freezer and heat! Sounds wonderful! Hi Laura! That is a great idea, and I don’t see why you couldn’t freeze it. I’m sure it’ll be delicious when reheated, and a real comfort on a cold night after a busy day. Hope you enjoy! Ingrid, we loved this soup! Made Rosemary Foccacia bread to serve with and the meal was outstanding. There are two of us. , This made 3 meals for each of us and the leftovers were as satisfying the last day as they on the first! Thank you, again, for sharing your recipes and technique with us!